Facebook lovers, this is a boon for you. With the HTC ChaCha FaceBook Phone hitting the markets, Facebook is now simpler and faster with the HTC Facebook button .An entire phone customized just for Facebook, now that’s what I call market capture policy. Share Music, photos, videos, links, give cool status updates and all you need to do is touch that magic Facebook button. HTC ChaCha’s Facebook chat widget makes it possible to get computer like experience on your mobile phones. Start a live instant chat, handle multiple conversations and enjoy. The conversation just keeps going on and on. In addition to the full QWERTY keyboard and the separate arrow keys, the 2.6″ 320×480 screen is still very much capable of receiving touch input. Website surfing with multiple browsing windows, built-in mp3 player, multiple accounts merged in a single inbox are the other features of ChaCha FaceBook Phone. 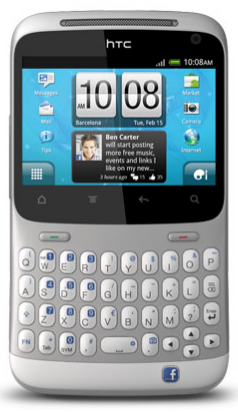 In short what makes the HTC ChaCha FaceBook Phone stand out from its competitors is the dedicated Facebook button. 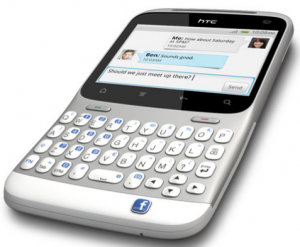 However, the lack of Flash support despite an 800 Mhz processor may cause the HTC ChaCha FaceBook to fall behind.